This is a brew that dates back to 1891 by the great grandfather of the current owner. It was made from 14 natural ingredients and then aged in birch bark barrels. In 1933 he opened a root beer stand. This brew is still made using the original recipe and still aged in birch bark barrels. I wonder where you can even find those. Another interesting tidbit is that they claim that their founder and root beer brewer, Oscar Weber Bilby, also invented the modern hamburger, and that the very same grill used to make the first burgers in the world is still used in the restaurant. I always thought the hamburger had something to do with Hamburg Germany, like a frankfurter with Frankfurt, but what do I know? It’s also been family owned for four generations. While Weber’s Superior Root Beer has been around for over 100 years, it hasn’t always been bottled. 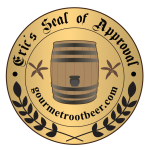 I had been in contact with the owners for awhile now, and they told me when they were finally confident that the bottled brew was as good as the fresh on tap, they would release it to the world. In January they finally got it ready and sent me a six-pack with some articles and a personalized letter telling about their history and their plans to sell their root beer. The Body has a rich, mature flavor. There’s sassafras and vanilla and birch going on but there’s more to it than that, you can taste that the ingredients have been aged in birch bark barrels. This has got some serious Bite. There’s spice all over the place, and several types. It’s good but almost a little too much for me. The Head is medium but very frothy. The Aftertaste is vanilla and birch with a lot of spice. This is a fine, fine brew that has uniqueness to it that I’ve never encountered. I’m chalking that up to aging the extract. Like a balsamic vinegar, it gets that mature, woody flavor. I wish it were more readily available around here as this is one of the best root beers I’ve ever had. Thankfully you can order it online, it’s definitely worth it. I hope I get a chance to try it fresh on tap someday. See how it rates against other root beers.